The cabin is located on Bridge Lake in the heart of British Columbia’s Cariboo. Bridge Lake is an easy 5½ hour drive from Vancouver, British Columbia. Bridge Lake has some of the best scenery and untouched wilderness in the province. This area offers a wide variety of activities during summer, fall, and winter. Fishing, hiking, canoeing, bird watching, sailing, boating, swimming, water-skiing, and winter sports such as cross country skiing and snowmobiling are just some of the activities to be enjoyed. The cabin is located on the east shore of Greenall Bay facing west. This allows for all day sun and spectacular sunsets in the evening. It is a quiet, peaceful, protected bay with only a few cabins along the shore. The waterfront is a great place to spend the day relaxing. Our private beach and dock provides safe swimming and safe moorage for your boat. If fishing is your passion then this area is for you. Bridge Lake is located on Hwy 24, also know as the 'Fishing Hwy'. Hwy 24 connects the towns of Little Fort and 100 Mile House. 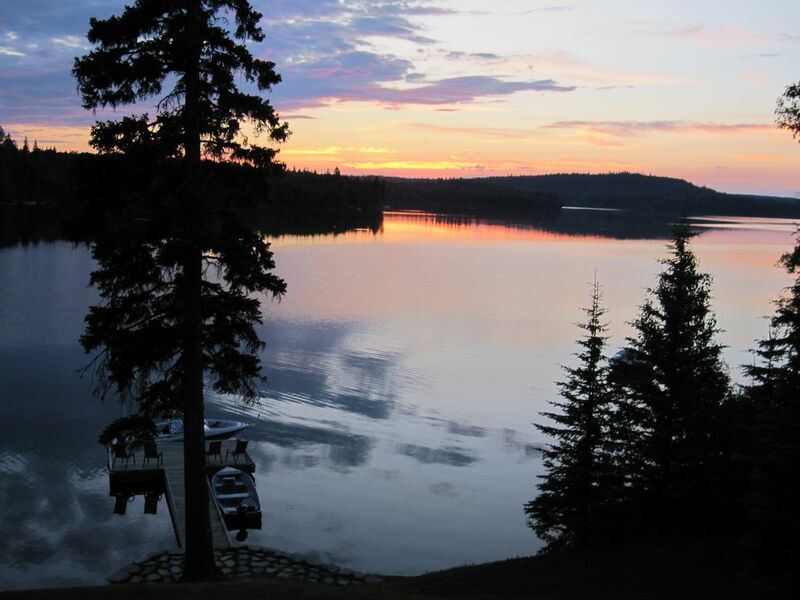 There are hundreds of quality lakes accessible from Hwy 24, some of which are well know 'trophy lakes' such as Sheridan Lake, Fawn Lake, Irish Lake, Boneparte Lake, and Lac de Roche. Lots of space for our 3 families - 3 generations. Beautiful lake. Brought our own canoe. Three families enjoyed a 7 night stay at this wonderful water-front cabin on Bridge Lake in Caribou District of BC. A total of 7 different sleeping locations allowed for perfect night-time separation of space for 4 grandchildren under 5 yoa. Large common living room, dining room & kitchen added to our 3 family cooking & eating experience. Large safe outdoor deck areas perfect for beach-ball soccer & hanging hammocks. Great dock space with clear cold water which tempted all for chilly dips on hot afternoons.Bonus was our opportunity to harvest morel mushrooms in the 2017 fire burned areas around Sheridan Lake. Cooler cloudy & rainy weather during the week allowed us more time for fun indoor activities (rack'em & stack'em pool) with chance to feed the local mosquitoes. In closing, a great home, with great separation of space for privacy as needed, on a beautiful lake in BC. All families agreed- we must return here! It was my third time in the cabin and we still love it. Wonderful, beautiful and very relaxing! Our family of 10, multi generation, had a week at the Cooper's place, we all thoroughly relaxed and enjoyed the peace of the lake and spaciousness and comfort of the cottage. Gorgeous sunsets, stars, water view from house. Excellently stocked kitchen. Loft was great for kids with a table and chairs for them to play their own games "privately". It did get really warm in the afternoons despite the high ceiling fans. The cool basement with a pool table was a welcomed relief when we needed it. The small grassy patch in front of the deck was also a nice area for games or just to sit on. A deer decided to do just that one afternoon! The short slope to the water may be a challenge to people with mobility issues but the well-maintained dock, extending out into the lake, is nice with available chairs to sit on or to cast a fishing rod from. The water off the dock was deep enough for the boat to be tied there. The gradual entry into the clean lake on the sides of the dock was great for my daughter and I to wade and look at the rocks and shells. Ducks and their ducklings, loons and their calls, bald eagle, etc all made this into a nice getaway for all of us! Thanks for a great stay, Mike!